Welcome to the Walla Walla County Democrats website. We are the Democrats, the party of the people, the party of good government. We believe in the values of community, dignity, equality, fairness, respect, and tolerance. We believe that through good government great things are accomplished. We pledge ourselves to a government that serves and protects its people, with liberty and justice for all. We work hard to elect Democrats and advance progressive policy. If you’re interested in getting involved, then we need your help! Become a member and get involved in our local organization. Like us on Facebook too. Thanks! 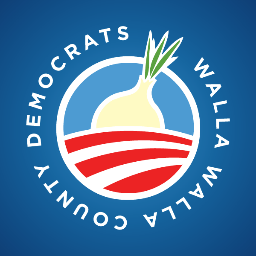 The Walla Walla County Democrats meet at 7:00 p.m. on the 4th Tuesday of each month, upstairs at Sapolil Cellars, 15 E. Main St. Everyone is welcome! Precinct Committee Officers are needed and if you are interested in being one or attending training, please leave a comment here or contact Steve Schmidt at schmidt3@charter.net.